An implant is perhaps the best form of missing tooth replacement in dentistry today. 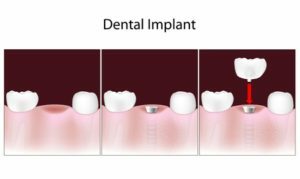 Unlike dentures and bridges, implants replace the crown as well as the root portion of a missing natural tooth. It has three main components; a crown, and abutment, and finally the implant itself. A crown, as the name indicates, is the topmost portion that is visible in the oral cavity. It is fabricated using porcelain and is made to match the shade and texture of the natural teeth. The abutment is the middle component which is connected to the implant, and upon which the crown rests. The implant is the portion that is embedded deep into the bone and offers anchorage to the entire unit. Today, implants are being used to hold complete and partial dentures in place. In case of complete dentures, a set of strategically placed four or six implants can be used to provide anchorage to the prosthesis. The procedure guarantees complete functional, aesthetic and speech restoration. At Baucum Family Dentistry, we offer our patients the very best in terms of consultation, treatment and follow ups. Get in touch with us today to learn more about how dental implants can transform your smile, and life! In 2008, Dr. Baucum met Dr. Richard Ross, a general dentist in Austin for over 30 years, who independently managed his own private practice. They agreed upon the transition of the practice to Dr. Baucum, and he moved back to Austin with his family to take over the practice in October 2008. Copyright © 2017 Baucum Family Dentristry. All Rights Reserved.